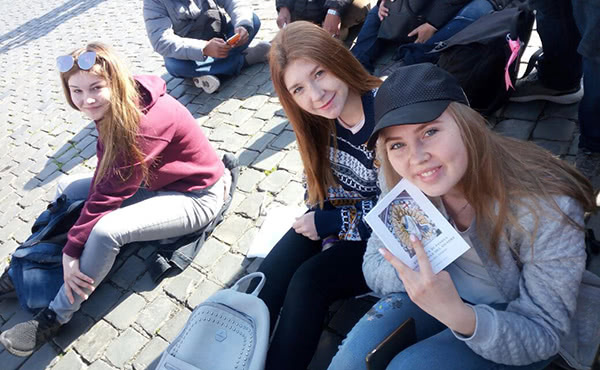 Natasha, 17, and Viktoria, 18, made their First Holy Communion this year in Rome, but both of them discovered the Catholic faith in their native Kazakhstan. Natasha, Viktoria and their friend Vicky. Natasha is studying to become a chef, and Viktoria wants to run a tour company. They are just like other teenagers their age, wearing the latest fads, cellphone in hand, with a lot of hopes and dreams for the future. Their physical features give away their Russian roots, with their light-colored hair and eyes. And their timid but smiling expressions offer a glimpse into their rich and hope-filled personalities. Two weeks ago, Natasha and Viktoria made the profession of faith in the Catholic Church. “My name is Natasha. I was born in Kazakhstan, 17 years ago. My father is in the military and that’s why my family lives in a town with other military families. I have six siblings, which is something unusual for my country. In my family, we were all baptized Orthodox. Traditionally in the Orthodox Church, at 40 days old a baby can finally be brought outside. So I was baptized then, but I never practiced the faith. "I currently study at an institute where I am preparing to become a chef. In my second year, I met Rosi and other people from Opus Dei. We became friends, and later on the opportunity arose to live in a residence. As I had lived in a different residence connected to my institute up until then, I said yes. "I was Christian but I didn’t know God. I knew that He existed and that He cared for me, but nothing else." "As I already mentioned, I was Christian but I didn’t know God. I knew that He existed and that He cared for me, but nothing else. I didn’t know what it was like to live close to Him. When I moved into the residence, I started to get to know Him in a deeper way. 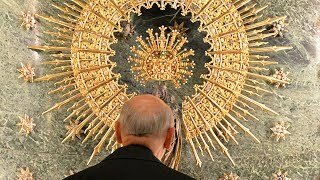 "I remember perfectly the first time I entered a Catholic church. I was with some girls from the residence, and it caused a deep change in my soul. I realized that I needed to become Catholic, and that this was my place. It was the first time in my life that I felt a great peace, although I had no idea what was going on. I found out later that they were celebrating Mass. Later, on Christmas Eve, I attended the Midnight Mass, which was decisive for me. "It helped me a lot to know about the possibility of attending a student Congress that happens every year in Rome for young people interested in hospitality. I was excited by the idea of going to the city where the Pope lived. So I began asking God for light, to know if I should become Catholic. And I eventually realized that, if God was giving me this opportunity to go to Rome, it was because He wanted me to become Catholic, and so I decided to take that step. On March 17th, I made the profession of faith with the Bishop of Almaty. It was the best thing that ever happened to me. Two of my siblings were present at the ceremony, which was such a great gift. My parents have also been supportive of my decision to become part of the Catholic Church. They have always said that they want what’s best for me, and that it’s the same faith; they are happy knowing that Catholics and Orthodox have a lot in common. "When we go back to Kazakstan, it won’t be so difficult to practice the faith, because with the Eucharist, we will have Jesus in our soul and with Him, we will have all His strength. The important thing is not to be separated from Jesus. I feel accompanied and I know that God has given me this gift. I am sure that He won’t abandon me. Hopefully the same thing will happen to everyone around me! After seeing my profession of faith, my older brother has become interested in receiving Christian formation. Apart from finishing my studies at the Institute and getting a university degree, what I would most like is that my family members become practicing Catholics. And I hope they can all make it to Rome someday too." "Although I am Catholic now, I want to keep receiving classes on the faith and go deeper in my formation." “I am 18 years old and I am from a small city near Almaty. In my family, we were all baptized in the Orthodox Church, but we never practiced the faith. I am studying to work in the tourist industry. When I met some people from Opus Dei, they invited me to live in the same residence as Natasha, because my house was far away. Ever since I started living there, I began to have many Catholic friends, and through their friendship I grew closer to God. Thanks to them, my interest in knowing more about God and the Catholic faith grew. A friend of mine from the residence – her name is also Victoria – is Catholic and has helped me a lot in my path towards the faith. "I began reading some of the writings of Saint Josemaría, the founder of Opus Dei and I also started attending catechism classes given by a priest at the center. At the church in my city, there are also classes for adults who want to know more and to make the profession of faith. "Although I am Catholic now, I want to keep receiving classes on the faith and go deeper in my formation. I want to share what I’ve learned with many other people, to make the message of the faith known and the joy that this gift has brought me. My dream is that my two older sisters and my parents will want to be Catholics one day. I know that the most important thing is to pray for them. "On Wednesday of Holy Week, I went to the Papal audience in St Peter’s Square and got to meet Pope Francis. When I began my studies of the Catholic faith, they explained to me that the Pope was the head of the Church, so I assumed that he would be a very distant, serious person. When I saw him for the first time, I was struck by his goodness, and I felt a great joy and peace. He is someone who is authentically worried about people and I was thrilled to get to meet him personally.